A SELF-PROCLAIMED WORDSMITH, LIGHTBOURNE'S RHYMING STYLE HAS EARNED THE RESPECT OF HER PEERS AND CAUGHT THE ATTENTION OF SEVERAL HIP-HOP NOTABLES INCLUDING DJ PREMIER. SHE IS THE RESURGENCE OF THE BOOM BAP EMCEE WITH A STYLE ALL HER OWN. LIGHTBOURNE HAS BEEN PUTTING IN WORK IN THE RAP TRENCHES. 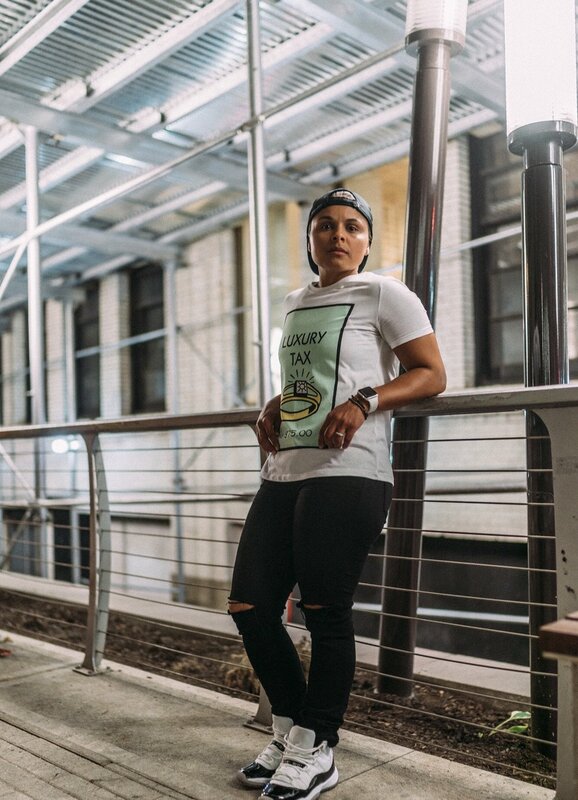 VALIDATED SPOKE WITH THE EMCEE REGARDING HER THOUGHTS ON THE BRONX HIP-HOP SCENE CURRENTLY, THE IMPORTANCE OF THE FEMALE EMCEES ROLE IN HIP-HOP, WHAT SETS HER APART FROM OTHER EMCEES AND MORE. LIGHTBOURNE: WATCHING VIDEO MUSIC BOX AND BEING GLUED TO THE T.V. AFTER SCHOOL. IT WAS SOMETHING ABOUT THE MUSIC AND THE CULTURE THAT I GRAVITATED TOWARDS. MY LOVE FOR HIP HOP GREW FURTHER AFTER LISTENING TO MIXTAPES MY BROTHER JIMMY WOULD BUY. I REMEMBER LISTENING TO DJ’S LIKE DOO WOP AND KID CAPRI. THE MUSIC LIT MY FACE UP WHEN I DID. IT WAS IMPACTFUL VERY EARLY ON IN MY LIFE. I WAS NINE YEARS OLD WHEN I WROTE MY FIRST RAP, ALL BY MYSELF. I WOULD SPEND HOURS ALONE WRITING. WRITING IS A TRUE PASSION OF MINE, THEN AND NOW. VALIDATED: WHAT DOES HIP-HOP, THE CULTURE MEAN TO YOU? LIGHTBOURNE: THE CULTURE MEANS A GREAT DEAL TO ME. GROWING UP ON SEDGWICK AVENUE, THE “BIRTHPLACE OF HIP HOP”, I FEEL A SPECIAL CONNECTION AND RESPONSIBILITY TO THE GENRE. ONE OF MY MANY GOALS IS TO CONTINUE TO DISPLAY THE LYRICISM AND ARTISTRY THAT HAS EXISTED IN THE CULTURE FROM THE VERY BEGINNING. MUSIC THAT DISPLAYS SUBSTANCE AND CONTENT THAT REFLECT THE TIMES IS A PRIORITY TO ME. I FEEL THAT HAS BEEN NOT AS EVIDENT IN THE GENRE AS OF LATE. VALIDATED: WHAT DO YOU THINK OF THE BRONX HIP-HOP SCENE RIGHT NOW? LIGHTBOURNE: THE BRONX SCENE IS VIBRANT AND I BELIEVE IT ALWAYS HAS BEEN. CARDI B IS ON FIRE. THERE ARE SO MANY AMAZING ARTISTS COMING OUT OF THE BRONX, IT’S GOING TO BE VERY EXCITING TO WATCH. VALIDATED: BEING FROM THE BRONX, HOW HAS IT INFLUENCED YOUR SOUND AND OUTLOOK ON HIP-HOP? LIGHTBOURNE: THE BRONX IS THE MECCA OF HIP HOP TO ME. LYRICISM IS A BIG DEAL IF YOU COME FROM THE BRONX. THEREFORE, I HAVE ALWAYS TAKEN PRIDE IN MAKING SURE MY WORDPLAY AND CREATIVITY WAS UP TO PAR. LIGHTBOURNE: THE ONLY ARTIST I CAN SAY INFLUENCED MY FLOW AND STYLE OF RAP IS RAKIM. I ADORED HIM WHEN I STARTED RAPPING AT 9 AND I STILL DO. I TAKE TREMENDOUS PRIDE IN BEING AUTHENTIC AND I HAVE NEVER BEEN INTRIGUED TO MIMIC OTHER EMCEE’S FORMS OF RAPPING. HOWEVER, THERE ARE COUNTLESS OTHER ARTISTS WHO INSPIRE AND MOTIVATE ME. ARTISTS SUCH AS JAY-Z, NAS, DA BRAT, AZ, BIG PUN… TOO MANY TO NAME! VALIDATED: AS A FEMALE EMCEE WHOSE VERSES HAVE SUBSTANCE, DO YOU FEEL YOU HAVE A RESPONSIBILITY TO THE HIP-HOP CULTURE? IF SO, IN WHAT WAY? LIGHTBOURNE: I BELIEVE EVERY ARTIST OR EMCEE HAS A RESPONSIBILITY TO THE CULTURE, NOT JUST AS A FEMALE EMCEE. UNFORTUNATELY, AS OF RECENT A LOT OF ARTISTS HAVE CHOSEN TO ABANDON THE CRAFT AND FOCUS ON THE FINANCIAL GAINS FROM THE GENRE. MY OBLIGATION AND VISION IN HIP HOP AND MUSIC IN GENERAL IS TO REFLECT MORE POSITIVITY AND EVERYDAY LIFE OCCURRENCES. VALIDATED: HOW IMPORTANT IS THE FEMALE EMCEES ROLE IN HIP-HOP? LIGHTBOURNE: BALANCE IS EVERYTHING IN LIFE. ALTHOUGH I FEEL THE GENRE SHOULD NOT SEPARATE EMCEES AND JUDGE THEM BASED ON GENDER, I DO ACKNOWLEDGE BOTH BRING DIFFERENT PERSPECTIVES TO THE MUSIC. WOMEN CAN SPEAK ON TOPICS AND ISSUES THAT MEN MAY NOT HAVE EXPERIENCED AND VICE VERSA. MY GOAL IS TO IN GENERAL FOR HIP HOP, NO MATTER THE GENDER DISPLAY LESS MISOGYNY AND VIOLENCE AND MORE EMPOWERMENT AND LOVE OVERALL. VALIDATED: DO YOU FEEL THERE IS A DIFFERENT EXPECTATION FOR FEMALE RAPPERS? IF SO, WHY? LIGHTBOURNE: I COMPLETELY FEEL FEMALE RAPPERS ARE JUDGED DIFFERENTLY. THE CLIMATE OF HIP HOP SOMEHOW SEEMS SURPRISED WHEN AN EMCEE THAT HAPPENS TO BE FEMALE IS LYRICALLY INCLINED. I NEVER UNDERSTOOD THAT. THE CULTURE AT TIMES SEES IT AS AN ANOMALY THAT WOMEN CAN FORMULATE METAPHORS AND LINES JUST AS WELL AS ITS MALE COUNTERPARTS. TECHNICALLY THERE SHOULD NOT BE A SEPARATION OF FEMALE AND MALE RAPPERS IN CATEGORIES. THERE IS NO STRENGTH ATTRIBUTE, LIKE IN SPORTS SEPARATING THE TWO. I STRIVE TO CHANGE THAT PARADIGM AND HAVE EVERYONE LOOK AT DOPE EMCEES AS JUST DOPE EMCEES. VALIDATED: IN COMPARISON TO ALL THE OTHER INDIE FEMALE EMCEES OUT RIGHT NOW, WHAT DO YOU FEEL SETS YOU APART FROM THEM? LIGHTBOURNE: I HONESTLY DON'T COMPARE MYSELF TO OTHER ARTISTS BASED ON GENDER. I SOLELY RELY ON MY AUTHENTICITY AS A PERSON, MY PASSION, CREATIVITY AND LYRICISM TO PROVIDE THE DIVISION. AUTHENTICITY IS WHAT THE PEOPLE EXPECT AND LOVE AND THEY WILL BE THE ONES THAT RECOGNIZE THE DIFFERENCE. SOCIETY CAN SPOT THAT AND IN RETURN HOPEFULLY GRAVITATES TOWARD THE LOVE AND GOOD VIBRATIONS MY MUSIC CONVEYS. LIGHTBOURNE: I AM IN THE PROCESS OF PUTTING TOGETHER AN EP, PLEASE BE ON THE LOOKOUT FOR IT. THE PROJECT WILL INCLUDE PRODUCTION FROM SEVERAL AMAZING PRODUCERS INCLUDING THE LEGENDARY PRODUCER, BUCKWILD.